Are you willing to make small changes in your lifestyle in order to accomplish your goals? We’re two weeks into the New Year. How would you rate your success at adhering to your New Year’s Resolutions? I’m on fire but also realize that some of my goals are not realistic so I will need to modify them slightly. One of the biggest differences between successful people and those who never reach their goals is follow-through. 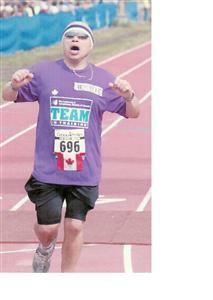 I remember when one of my best friends Herbie Kuhn decided to run the Ottawa half-marathon. He finished strong setting a personal best of 1:50:38. Throughout the course of his training, Herbie had many legitimate reasons why he could have quit. To train for this event he had to sacrifice a lot of time away from his family; he was often away at various speaking engagements; many morning were extremely cold and blustery; he was often physically exhausted from a busy work schedule and unsettled sleep patterns. Yet despite all of the challenges he persevered. Imagine what your life would be like if you were able to stay the course and finish what you start. Imagine how you would feel if you released the excess weight and never put it back on again. Like my brother Herbie, I encourage you to persevere regardless of the trials and set-backs. Know that it will take discipline and a change in lifestyle. No-one really wants to get out of their comfort zone but it is necessary in order to be successful at anything. At times you may have to sacrifice time with your loved ones, doing things that other ‘normal’ people do or doing things that you enjoy. But know that it is only for a season and you will reap a major harvest if you stay the course. Every time that you start something and never finish, you get more and more comfortable with quitting-sadly, it can become very familiar after a while. Conversely, every time we see a task through to the end, it strengthens your resolve, our discipline, your sense of accomplishment and your faith. Every success we experience prepares us for even higher levels of success. This is the level that we should strive to live at daily. Purpose to reach your health and fitness goals in 2011.